SIGN-UP WITH OUR SAN DIEGO SURF CAMP FOR AN AWESOME WEEK OF SURFING with Surf Lessons San Diego! With surf lessons at Pacific Surf in San Diego, our surf instructors and day camp monitors/leaders/coordinators are qualified ocean lifeguards, certified in Water Safety, CPR and First Aid. Students will be taught water safety techniques and ocean environmental education training with our dedicated, licensed and knowledgeable staff. Our surf camps are offered to children between the ages of 7-17 with little or no experience necessary. Your child will have his or her own tailored surf instruction according to their age group and level of experience on and off the water by one of our highly experienced surf instructors. Our team of instructors at surf camp San Diego will work individually with each student to make sure that they learn to surf the correct way, without creating any “bad habits”. Watch yourself progress to another level of surfing by the end of the week with our proven teaching techniques and water safety instruction. On the final day of camp, we like to add some friendly competition into the mix so that the students are able to show off what they’ve learned. Come spend your 2019 Summer Break on the beach with Pacific Surf School! At our Summer Camps you’ll be surfing like a pro in no time! AM/Morning Session | 9am – 12pm offered at our Pacific Beach and Ocean Beach location. Bring your own lunch every day besides Friday. 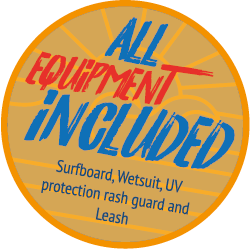 Includes: surfboards, wetsuits, t-shirts, certificate, pizza party on friday with awards ceremony and Surf Competition. Sign up for our surf camp in San Diego Surf School today! INTERESTED IN OUR SURF CAMP?